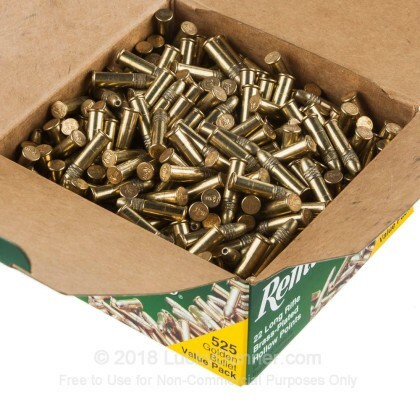 The Golden Bullet bulk pack from Remington is world renown for offering quality rimfire ammunition at an affordable price. 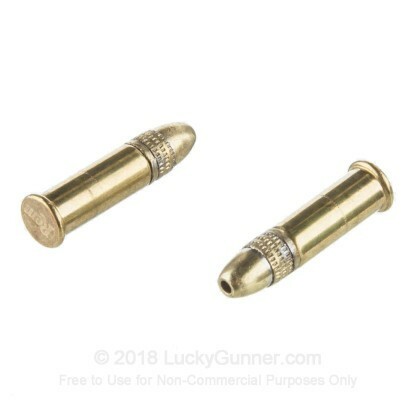 These .22 long rifle rounds come equipped with a 36 grain hollow point projectile and are an ideal round for the high volume shooter who likes to go plinking all day at the range. These rounds are also effective for small game during varmint hunts. Loaded into a brass rimfire primed casing, Remington’s .22s are capable of a muzzle velocity of 1280 fps and are non-corrosive. 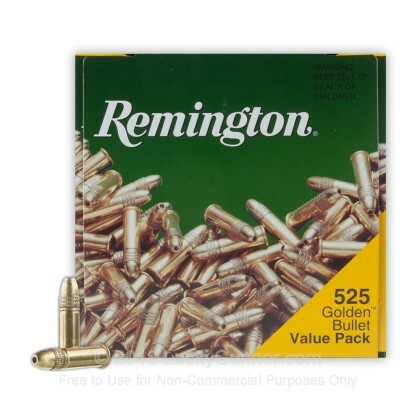 Each box of Golden Bullet Remington comes with 525 rounds of .22 LR. As one of the nation’s oldest firearm manufacturers, Remington is a popular choice among discerning hunters and target shooters the world over. Utilizing their cutting-edge facility at “The Rock”, they are at the forefront of ammunition firearms technology, while still delivering the legendary quality and reliability that made Remington a household name. Have been running these Remington hollow points for many years mainly spatsies, nuisance black birds, and starlings...They have been accurate, no failures in Colt heavy barrel, 1973 Ruger, Anschutz, and Nylon 66...Have bought for accuracy, safety as in they don't ricochet, fairly easy to source.. 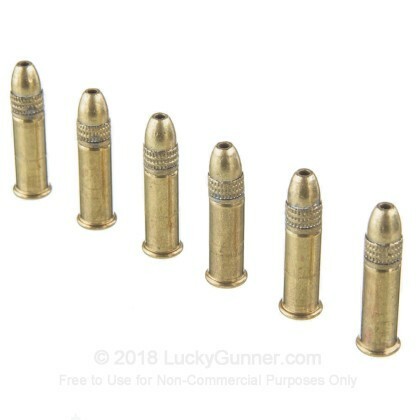 Pretty good ammo, works well in most of my guns. Runs good in all of my semiauto 22 rifles and my Ruger Mark 3. Only gun that doesn’t like it is my sig mosquito. There is a reason that these are so cheap. I have had a lot of jams and misfires with them. They are fine for plinking, but I wouldn't want to have them in my gun for any shot that mattered. Ran it through my Marlin Model 60 and it ran better than the Federal automatch. Less FTE and FTF but it is dirty ammo. Had a few hangups after 135 rounds. I clean my gun after every range time and it looked like I shot at least 400 rounds when I only shot 200. If you don't clean your gun after every range time you will get problems and your barrel will get a lot of fowling. But good cheap ammo if you're a college student. Easy to place an order, whether you're on line or talking to a helpful person at the company, the guys here, delivered at reasonable prices. 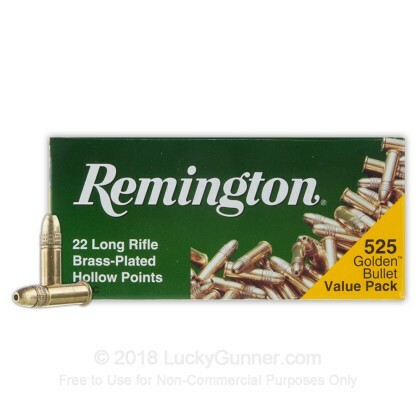 Thanks for the great price on 22LR ammo. The price was much better than any other business. I've run half of the rounds down range and have had little or no problems. 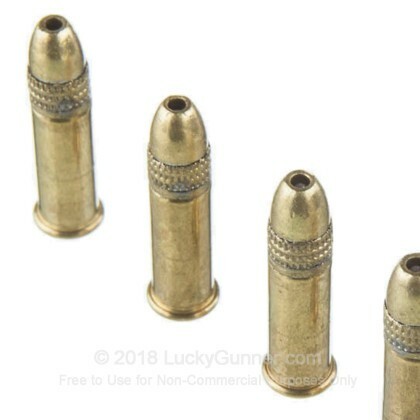 With the exception of one misshapen bullet, I've had no problems shooting a box of this ammo through both a Colt Umarex 1911 22, and the venerable Buckmark. It is a little dirty, though. While the Buckmark didn't flinch, the Colt required a good cleaning at about the 300 round mark. Concurrent with the Remington box, I was shooting through a box of Federal bulk ammo. They both performed similarly, though the federal had more FTL's. My gallery requires jacketed rounds. For the money this can't be beat. I'm glad I purchased 6300 rounds. Ran all 525 rounds through my Ruger SR22 in one trip to the range. Not one misfire or issue with the entire box. The ammo is a bit dirty. This ammo functions well through a Ruger 10/22 with factory mags. This stuff is cheap and shoots as accurately as can be expected. For cheap plinking ammo, this stuff is the best. However after several hundred rounds it fouls the gun and needs some cleaning. Had a few jams in a pistol and about 2 misfires per 100 rounds. I have fired several boxes of this ammo through everything from .22 rifles and pistols to several .22 conversion kits (1911 and AR-15). It is not a flawless ammo, but then again, I didn't pay that much for it. It is a phenomenal way to reduce the cost of doing weapon drills with the conversion kits installed and I cannot complain about the cost and the reliability. In over 1500 rounds, I have had maybe 10 fail-to-fire rounds. Frankly, with a very good rifle, this has proven very effective on taking everything from cottontails to coyotes. You can buy better ammo, but you will have to pay a lot more for it. A very good product at a good price. A top quality product! And the price was right. I've had frequent FTF in my S&W 22A, S&W 617 Revolver, and Ruger MK III. I say "had" because l no longer use this product. Also, this ammo is much dirtier than the Federal Value Pack .22 L R I am currently using. I've used these rounds before, so I knew what I was getting. Consistent performance and fewer misfires. With the usual excellent service from Lucky Gunner, I received my purchase in less than 24 hours of placing my order. Still working through the first box. So far had several jams, no misfires or duds. Hard to say if the jams are the rounds or the magazine. The 10/22 Magazines have their fair share of poor function reviews. It's erratic though. Some magazines get emptied with no jams, others get one per, one even got three. All the same, I will purchase this ammo again as long as it stays as cheap as it is. My life isn't depending on the reliability of my 22LR cartridges. 22 is all about fun, and this ammo provides it in spades. You can't go wrong with a plated hollow point at this price. Shot 100 rounds with my new Bersa Thunder 22, great time. Had a few misfires other than that shells were accurrate and I am pleased witn my purchase but I haven't ever bought some .22's that didn't have a few duds so its all good. GOOD BEER CAN KILLERS !!!!!!! WELL FOR THE MONEY IT HARD TO BEAT !!!!!!!!! EVEN A POOR FAMILY MAN LIKE MYSELF CAN AFFORD TO SLING SUM LEAD ON THE FARM !!!!! THIS AMMO KILLS GAME ASWELL U JUST HAVE TO PUMP THE BIG GAME FULL OF THEM !!!!!! BUY THEM THEY WORK !!!!!!! Shot 300 rounds through a Browning pistol and had 7 rounds that failed to fire. Groups were tight when they did fire.